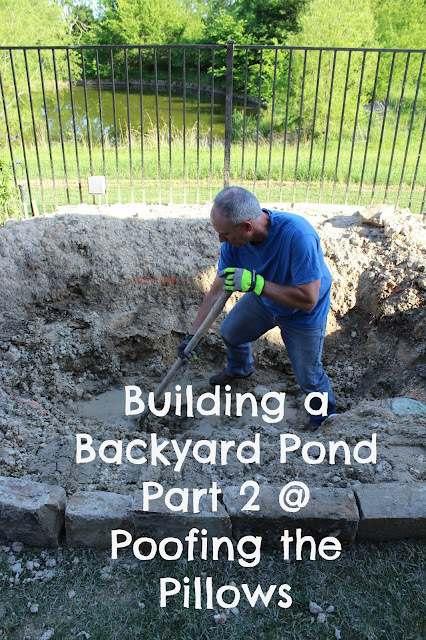 Welcome back to part 2 of digging a backyard pond. This is definitely the ugly before pretty phase of this project. Just imagine lots of mud in the yard and tracking in the house. Yes, that's life right now but it's very worth it. We want our pond to be much smaller than the last and about 36-40ish inches deep for the fish who will reside here. If the water is much shallower, the water will be too cold in the winter and too hot in the summer. Plants will be in the water and around the perimeter when this is complete. Our yard slopes just a little so it's very important for the edges of the pond to be level or the water will run into the pond or out of the pond when it rains. My husband and son built a berm around the entire perimeter of the pond using the dirt that came from the hole. 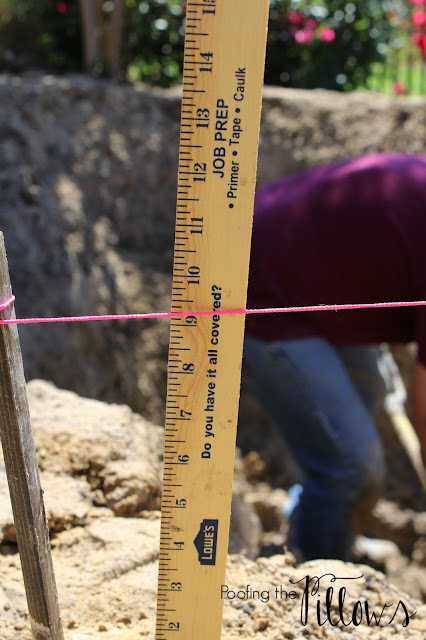 A string level was used to make sure the berm is level from front to back. You can see the berm a little better below. See the big cinder block? Lots of muscle power + a cinder block = tamped dirt. 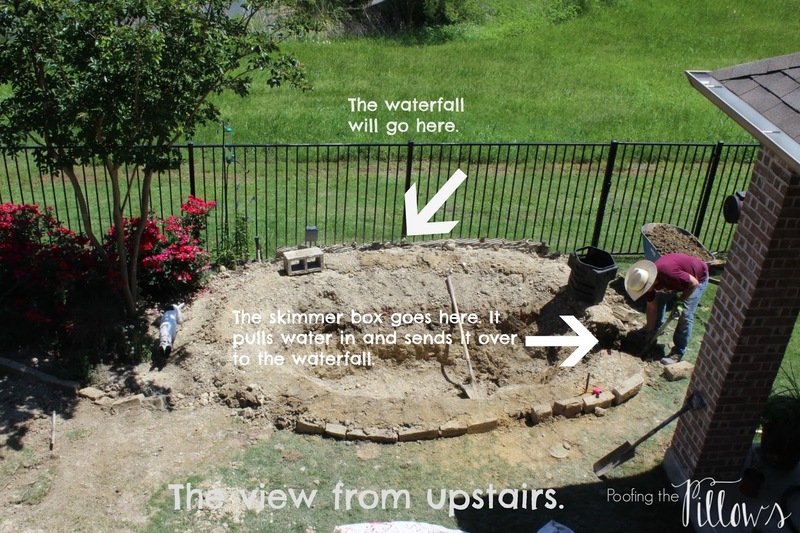 The waterfall will go on the backside of the pond. That's where we are right now! We've been to the rock place and selected a pallet of smaller mossy boulders that will be mixed with some flat rocks on the berm. Choosing the right rocks is one of the most important parts of making this look great. To see part 1 go here. I didn't realize how deep this needs to be and why. That's so good to know. Your sweet husband is such a trooper and I know all the rain has not made this any easier! But it is sure going to be beautiful when it's all finished. BTW the McKinney garden tour is coming up in June. I thought of you when I saw the date! It looks like you two are moving well along with the pond construction!....Love the spot you chose for it! You guys are amazing. I bow down to you in admiration. And wow -- is it ever going to be spectacular when you finish! Hi Stacey! Oh, your little pond is coming right along! 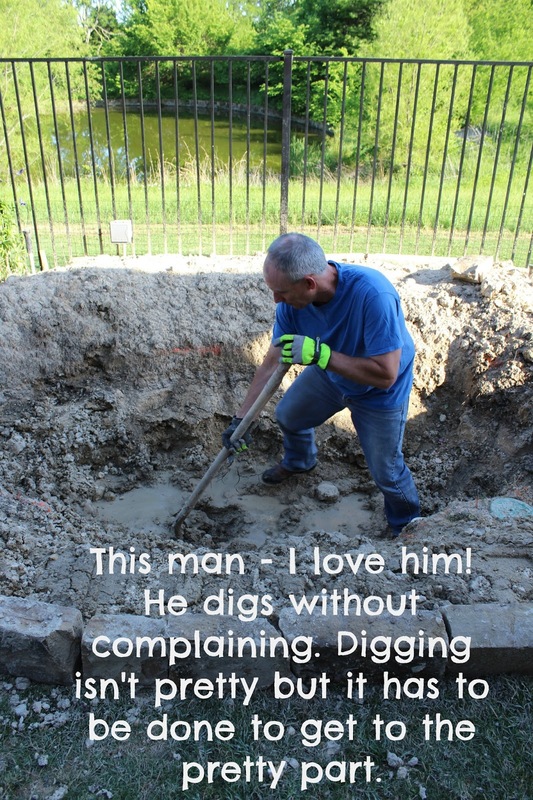 God bless your digging hubby, even in the mud! I know you're so excited about this and I can't wait to see it finished - it'll be gorgeous. We just took the netting off our pond and it is now ready for spring and summer. I love seeing all our fish again!! They have gotten so big and are eating us out of house and home!! Progress!! I hope it stays dry and you can get rid of some of that mud. We just removed the screen from our pond and it was good to see that our friends had made it through the winter. It gets really cold here, the pond actually ices over, so you're right, an appropriate depth is so important! :) Can't wait to see it come together! Wow, Stacey! You two rock in my world! I'm impressed and can't wait to see the pond when it is done, I'm sure it'll be beautiful! Please take care while out there! You Guys are the best! 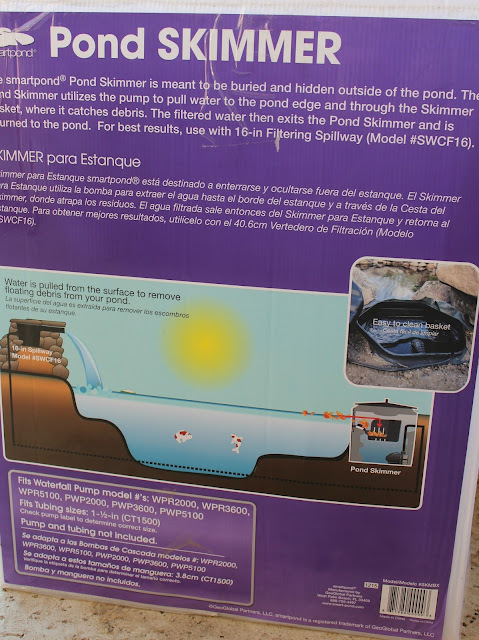 And these tips are spot on because I know so many people that put in ponds and had so much trouble doing it. We had a pond with Koi at our last house and just loved it but I've never done one here but now you make me really want to build one again! I'm enjoying going on the journey of the pond, Stacey, and I love that you showcased your sweet hubby and all his hard work, and your son, too. It's going to be so beautiful! I finally had another company come out to get my little waterfall working again. Yea!!! You have such a perfect spot for this project! It's looking good. Bless his heart! Our men don't get enough credit for all the backbreaking work they put in over the years to make all those pretty projects we think up. I am so glad God made men :) It's almost to the exciting part of being put together! I can't wait to see it finished. It is going to be wonderful! I am looking forward to the finished pond! Thanks for the farmhouse link! Just gorgeous! You guys are experts! I didn't know any of this. It looks like it's going to be beautiful! Yes, I do know how hard this is as I have been digging for days at our new home. Actually, my back burned like crazy the first week but I didn't quit and now I can tell I am much stronger in the back and the thighs. He is doing a great job and think how darling it will be when done. I drive my hubby crazy with projects! Thanks for sharing and linking. I am so excited to see your lovely oasis when you are all done! I had no idea so much work went into building a pond...probably why I don't have one. :-) Thanks for the step-by-step posts--I always look forward to your updates! Stacey, I am so impressed by your ingenuity and gumption. Give that guy a big smack on the cheek for digging your pond. I can't wait to see the finished result. I know it will be beautiful. Looks like so much work but know it will be gorgeous when finished. Your pond is going to be so great. One of the good things about digging between rains is that the rain keeps the ground diggable. Once the rains stop for the summer, my dirt becomes a brick. Digging is hard work, but you and your husband will be so rewarded with the beauty of it all when this project is completed. Keep enjoying and sharing the process. This is looking awesome, love following fun projects. We've had so much rain, it looks like you may have sandy soil? 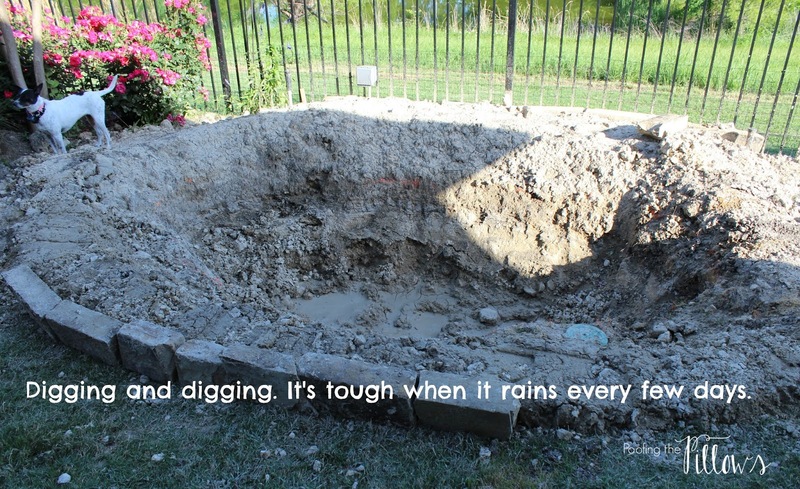 Hope so because that's much easier to dig when wet over that clay. Working outside is so rewarding you all are going to enjoy this project. So much better when you DIY it. It is lots of hard work but oh my it is going to be awesome. I cannot wait to see this finished. Looking forward to seeing the finished project. Wow, your hubby must really REALLY love you!! Ha ha you are doing a great job - can't wait to see the completed project!! I always wanted a pond but then I realized it would be too much work for our little yard. And I would be doing the work because Joe would not want anything to do with it! He is so not into nlike that!! This is awesome, Stacey! Love it. And you have two hardworking guys. You should submit this to Hometalk...so many will benefit from your great tutorial. What a job. I'm excited for you and for your fish. Amazing that they can survive Texas summers and winters. I can't wait to see more. I didn't realize how much work is involved. But you said it best, it will all be worth it!!! You guys are making quick progress! I love the shape you chose and the location....it is going to be beautiful!!!!! Oh, I can see we may be on a "post famine" when this pond and waterfall are completed....you will be spending all you leisure time (ha!) lounging out by the pond, sipping something chilled and eating bonbons! Well, that's what I'd be doing, anyway! Your honey is a hard worker, so you better give him something chilled to sip! this is going to be so amazing!!! can't wait to see the result!!! 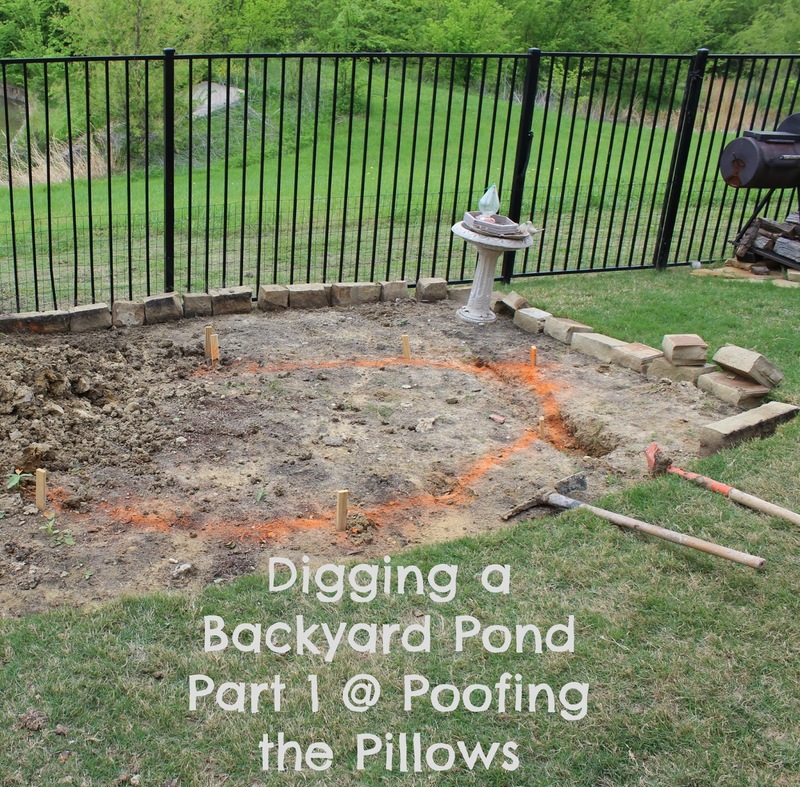 I can't believe you are building the pond yourself because it looks like way too much work. I can't wait to see it all finished. Just letting you know that this post is featured on my blog today! Congratulations! Can't wait to see the finished pond! Well done! Setting up a greenhouse pond is simple than keeping up a pond. After development parcel of issues welcome you so you should need Concrete Pond Coatings to secure your pond.